Contemporary documents mention the existence of a stronghold in the XIV century situated on the current site of the castle; a royal fortress with an elliptical shape and a refuge tower at the north wing, protected on the South side by a stone wall. This estate belonging to the D’Anjou family became the property of the Corvins at the beginning of the XV century (1409), during the time of the nobleman Voicu. 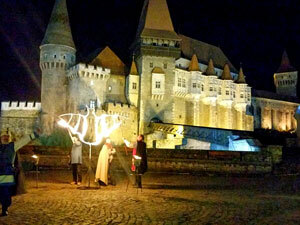 It was given to them, including the fortress and the estate of Hunedoara. During this time the name of the Corvins was mentioned, when king Sigismund of Luxemburg offered the above estate and the castle as reward for special military excellence. Voicu’s son, Ioan of Hunedoara (Johannes Corvin of Hunyad) enlarged the construction from the XIV century. As a result of two successive construction stages a new wall was developed between 1441-1446, equipped with 7 protective towers. He also built most of the Chapel, the proper palace (The Council Hall, The Knights Hall) the tower of the winding stairway and to the South side household facilities, during the second stage (1446 - 1453). After a number of confrontations with the Ottoman Empire, IoanCorvin named the military governor of the Hungarian Kingdom, died after the battle at Belgrade (1456). ElisabtehSzilagy, his wife and their son, Matthew Corvin one of the best kings of medieval Hungary, had built the loggia in the North wing, completed the construction of the Chapel and the Council chamber and continued the work of improving the castle. In the XV century the castle was a unique example of a nobleman fortified residence for the Transylvanian area dwelling combining specific elements of late Gothic and early Renaissance style. The Corvins owned the castle and the state of Hunedoara until to 1508, followed by other owners until the XVIII century, when the castle and estate became the property of the Hapsburg Empire, and the castle itself was turned into administrative headquarters for the mines as well as storage for iron products (1724-1854). The destiny of the castle is linked in the XVII century with the personality of Prince Gabriel Bethlen (1613-1629) who had some interior modifications executed. He remodelled the castle to suit the defensive demands of the time, by having the white tower, the artillery platform, the inner walls and the Bethlen wing, two new entrances into the castle opened to the new gate tower. After a series of minor modifications and fires, the last fire in 1854 destroyed the whole wooden structure of the castle. The first restoration work started in 1868-1874. As a result the roof of the castle was replaced with a tile roof, some of the towers were moreelevated, a neo Gothic facade was built next to the bethlen palace, and some interior works and fittings were undertaken. 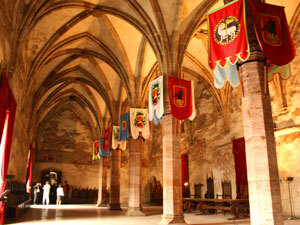 Turning the castle into a museum occurred in 1974 preceded by another restoration and consolidation stage (1956-1968). From 1997, the restoration work continued to now.